With a rich cappuccino surface and a stylish thick paneled design, this 2 piece nesting table set gives an exceptional look to any room. The original criss-cross chromed metal base provides sturdy support as well as a clean, contemporary look. Use this multi-functional set as end tables, lamp tables, decorative display tables, or simply as accent pieces for any living space. Large Table: 20"L x 20"W x 20"H Small Table: 16" x 16" x 17"
This fashionable and contemporary set of 2 nesting tables adds a bold dimension to a room. The thick, clear square tempered glass top gives it a light look and is spacious enough to hold a lamp, pictures, drinks and snacks while entertaining. The tables are framed in a rich black nickel metal base with an X design on the sides for a touch of sophisticated glamour. This table set is so multi-functional to use as end tables or placed apart to set drinks and hors d'oeuvres when entertaining. They are also a space saver as one table stores neatly underneath the other as a striking display. Assembly is required. This set of 2 contemporary style nesting tables bring fashion and function to your living space. The thick glossy white square tabletop is spacious enough to hold a lamp, pictures, drinks or snacks. The chrome metal base with a unique circle intersected by an X leg design gives a statement appeal while providing solid support. This multi-functional table set is neatly stored one under the other for a space saving solution, and can be used as end tables or simply pulled out as snack tables when entertaining. The classic lines of these nesting tables will suit most decors. Assembly is required. Make a statement in your living room with a three piece occasional table set that's sure to take center stage. 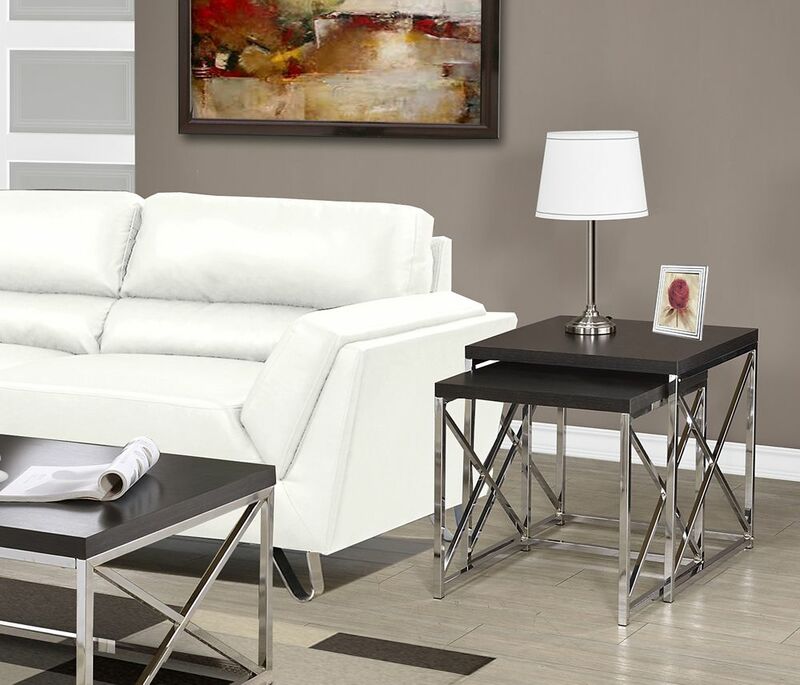 This versatile accent table group includes a rectangular coffee table and two matching end tables that make a stylish addition to casual or contemporary decor. Marble look tops draw the eye with their muted shades of cream, onyx and gray and provide a durable yet beautiful surface for placing drinks and decorative accents. A sophisticated cappuccino finish wraps the base of the coffee and end tables, which feature lower shelves that offer additional space for storage or display. Tapered feet finish each piece and provide a sturdy foundation for lamps, potted plants and decor. Add fresh vitality to your living space with this modern 3 piece coffee table set in a warm cappuccino finish. The smooth and spacious laminate table tops are supported with simply designed sturdy silver metal legs, accented with an X design on the sides for that extra appeal. The two matching square side tables can easily hold a lamp, pictures, or decorative accessories to compliment the elegant rectangular coffee table. This contemporary table set will perfectly anchor your living room, family room, or den with style! Nesting Table - 2pcs Set / Cappuccino With Chrome Metal With a rich cappuccino surface and a stylish thick paneled design, this 2 piece nesting table set gives an exceptional look to any room. The original criss-cross chromed metal base provides sturdy support as well as a clean, contemporary look. Use this multi-functional set as end tables, lamp tables, decorative display tables, or simply as accent pieces for any living space. Nesting Table - 2pcs Set / Cappuccino With Chrome Metal is rated 4.0 out of 5 by 1.